Robert Deane was the son of James and Margaret Deane (nee Patterson). Robert was born in Ballygawley on 12 May 1869. He was also baptised in Ballygawley. 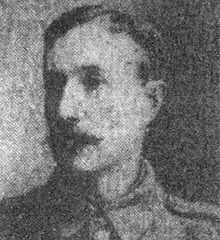 Robert enlisted in Belfast at the outbreak of war. 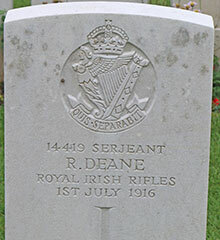 Sergeant Robert Deane was serving with the 10th Battalion of the Royal Irish Rifles when he was reported as being killed in action on the first day of the Somme, the 1st July 1916. He was aged about 47.